The ‘death by glass of water’ in March of our trusty laptop has resulted in a bit of a tumble off the blogging wagon recently. That combined with a busy month of visitors and an ever growing baby belly have seen me get behind again on the blog, so I thought I’d do a bit of a brief ‘catch up’ post today to fill you in on what has been happening at Fealy Family HQ over the last month. 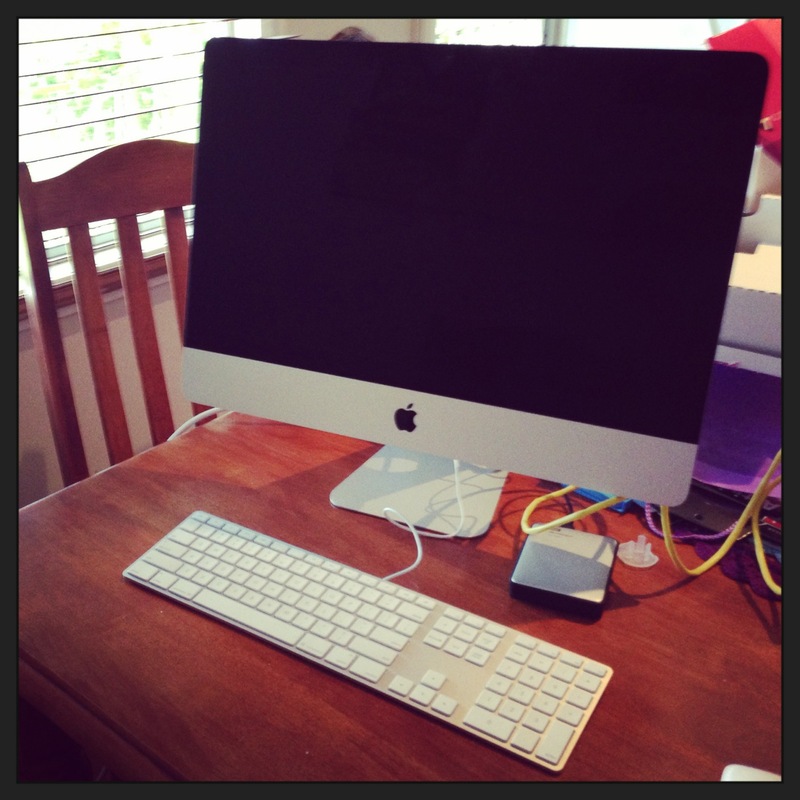 Oh, and the photo above is the brand new ‘blogging machine’ that I’m now writing on – pretty spiffy hey! Ok, here’s the lowdown …………………………………………………………………………….. The last 6 weeks have been lots about puppies! Our dog ‘Patches’ (short haired border collie) and ‘Captain’ our farm hand’s dog (long haired border collie) had a litter of 9 pups (5 girls and 4 boys) in early March and we have had sooooooooo much fun with them! We have kept one pup ‘Beau’ for ourselves and have managed to now find homes for all the others. It feels very quiet now without them all running around! I must admit that Matt and I have probably enjoyed the puppies even more than the kids with many an afternoon spent out on the lawn with them! Hours and hours of fun in the school holidays for the kids! The puppies were a great learning curve and provided lots of discussion about the impending new addition of Baby No 4 to our family! The nursery is pretty much ready now and we are all just patiently, patiently waiting for this baby to arrive! 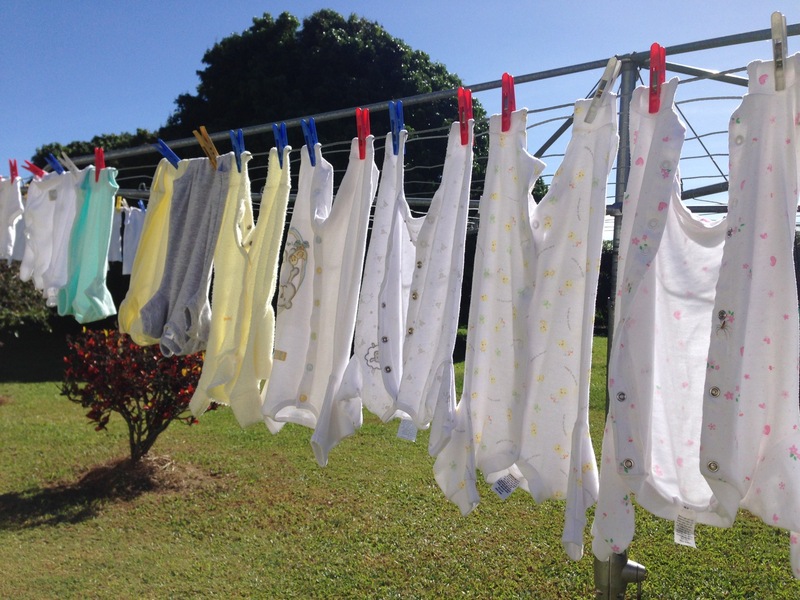 Hand me downs from family have been washed and now awaiting Bub No 4! On the farm front we have now finished the mango and avocado season and have recently pulled out and replanted 4,500 new passionfruit vines! We are definitely enjoying the slow down in pace and the peace and quiet of having the farm mostly to ourselves these days! We have had lots of visitors! The Tronson cousies from Townsville visited! The Johnson Family visited from Brisbane! And I spent some time doing a bit of ‘tikki touring’ around the Tableland’s with my friend Tamie who visited from Brisbane as well. Oh, and I nearly forgot – we had Tropical Cyclone Ita come through town too! Luckily for us she was only a category one cyclone by the time she made it to Mareeba so we suffered no damage at all, just lots of rain which was very welcome! We were a little worried that Bub No 4 might arrive early during the cyclone but thankfully that didn’t occur either! 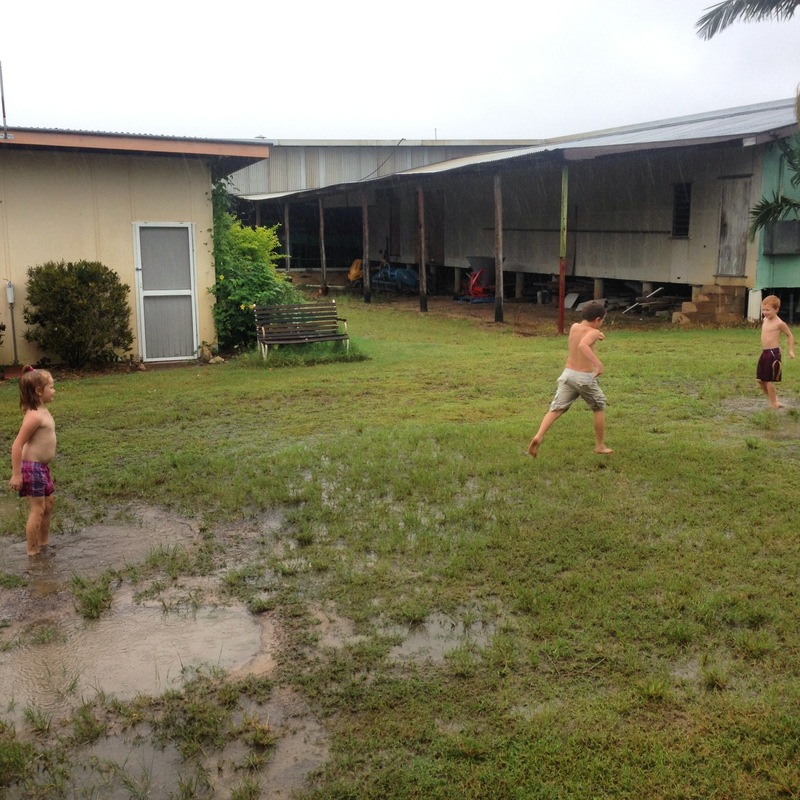 Kids making the most of the rain brought by Cyclone Ita! 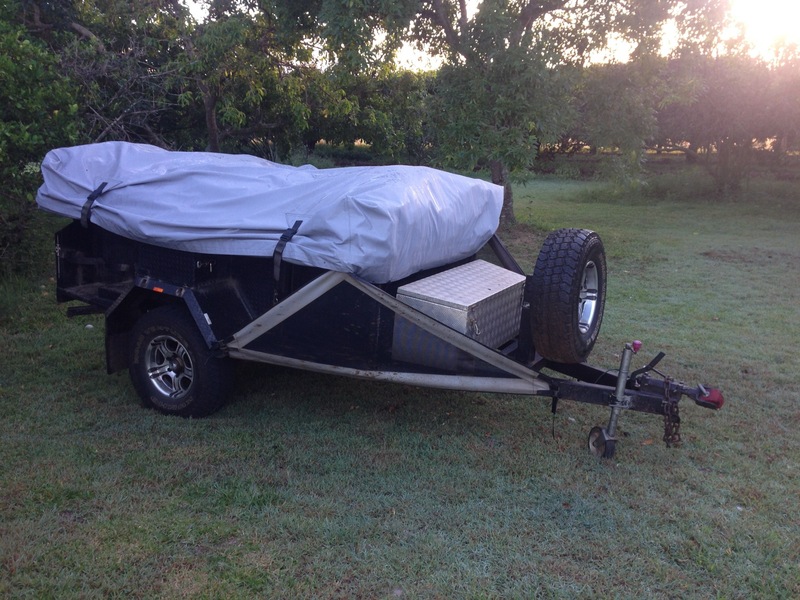 Lastly, the big news is that we have purchased a Camper Trailer – wahooooo! 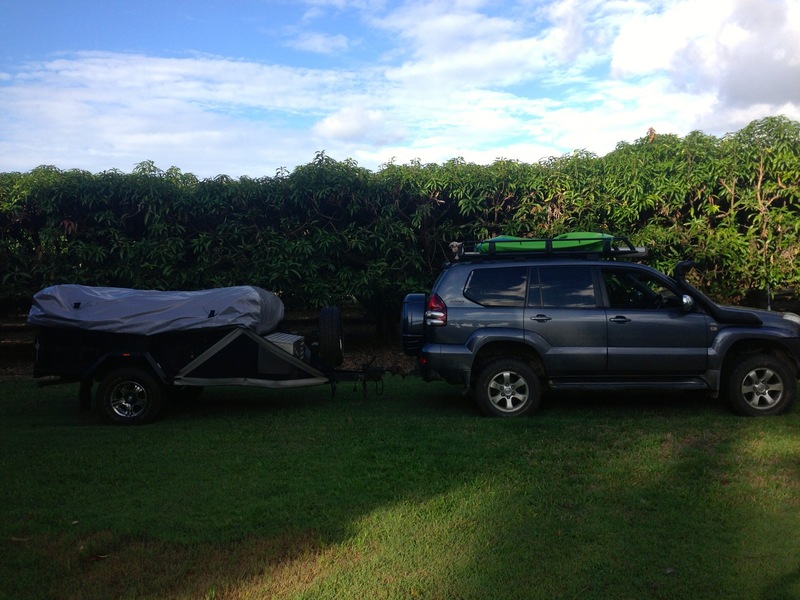 It was a very tough decision on which type of camper trailer to get as there are just so many on the market but in the end we have settled on a 2010 model ‘All Terrain’ Camper. There will be a blog post to come from Matt with all the specs, but the thing I am most excited about is that it has a ‘Moon Roof’! It was Matt and I’s 11 year wedding anniversary on Sunday (yes – Easter Sunday) and Matt very romantically invited me out to the camper to check out the stars from our bed in the camper – not the easiest feat to climb up into the camper bed at 9months pregnant but the view was pretty good!! Now we just can’t wait to get away on our first camping trip!! Bring on a trip away!! Introducing ‘Black Betty’ (thanks for the name idea Dad!) – the new Fealy Family camping wagon! And that’s the wrap up of the last month. What’s been happening in your worlds lately?? Any new additions to the family? Where is the current photo of you ?? Great pictures and VERY cute puppies. Nic thinks it’s a boy and will be born on Sunday. It’s a good thing you found homes for those pups or I might have had a new family addition too!! Ha! Love the new blogging machine, I’m hoping Santa might bring me a machine too!! (Finally tiring of doing all my blogging on the iPhone & iPad!). 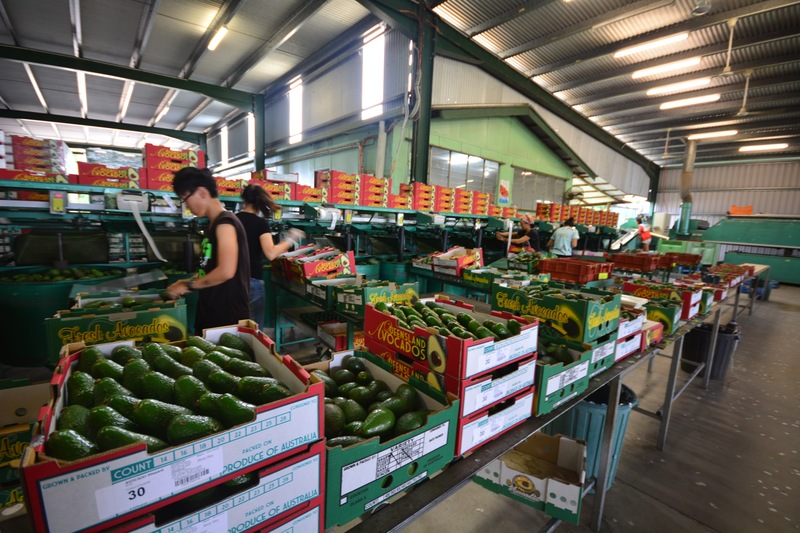 Not much more exciting news here….except there may be the tiniest of tiny chances we could be a couple of thousand km closer to Mango & Avocado Heaven (Fealy Family HQ) soon….. So where are you sleeping 2 adults and 4 children into the camper?? I checked out the website and am still bemused!!! Never mind, i am sure you have that all figured out!!! As we are heading for Cairns, planning to arrive sometime in the next … Ummm, 2-6 months?? can we call in on you? I’d love to see the shed in operation… and baby #4, who should have arrived by then … LOL!!! !